SAN FRANCISCO: Ive always like Subarus. Heck, Im one of the few writers who liked the Impreza 2.5 RS just the way it was. Sure, it could have used a little more power, but what car couldnt? But it was a very impressive and fun car to drive just the way it was. And now Subaru has finally responded to all the comments. 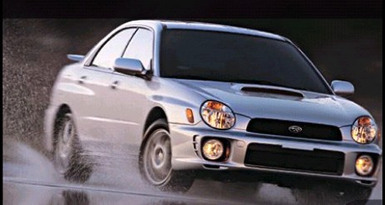 The 2002 Subaru Impreza WRX is a true performance car by any measure. A 2.0-liter, 227-horsepower turbocharged engine powers the WRX. Like all Subaru engines, it is a flat, opposed design. It seems that Subaru has followed the European tradition of making its turbocharged engines smaller than the regularly aspirated one it replaces (the RS had a 2.5-liter). Why I dont know, but who can argue with 227 h.p.? And with 217 lb.-ft. of torque at 4,000 rpm the WRX accelerates from 0-60 mph in just 6.1 seconds with the manual transmission. The standard 5-speed manual transmission is teamed with full-time viscous-coupling All-Wheel Drive (AWD). The optional four-speed electronic automatic transmission (4EAT) comes teamed with Variable Torque Distribution All-Wheel Drive (VTD). For my money you should stick to the 5-speed manual in the WRX, its more fun to shift for yourself, and the fuel economy is pretty good at 20-mpg city and 27 highway. Like all Subarus, the WRX is equipped with full-time AWD for great grip on all types of road surfaces, dry or wet. A viscous limited-slip rear differential ensures that the rear tire with the best traction receives the most power. What this means to you and me (and your kids should you buy them a WRX) is that its really hard to get into trouble. That doesnt mean that you cant get in over your head. But if you drive prudently the WRX will not let you down or embarrass you. The down side to AWD is that you cant do any smokey burnouts. Do you have any idea how tough it is to get all four wheels spinning when you leave a stoplight? Common sense and respect for the machinery limited my attempts. Just in case someone else runs into you (say one of those oversized SUVs) every 2002 Impreza has three-point seatbelts for all five seating positions (pre-tensioners and force limiters in front), a four-channel and four-sensor anti-lock brake system (ABS), and dual front airbags. The WRX models add standard front seat side impact air bags. To help you be seen, every Subaru has daytime running lights. And in case your kids like to play in the cars trunk, there is a self-illuminating internal child safety trunk release handle. Bet you were wondering what WRX stood for, werent you? I know the WR stands for World Rally (Championship). Im not sure about the X (experimental?). The World Rally Championship is kind of like the X-Games on wheels. Madmen (and women) drive over, through, and around impossible terrain at ungodly rates of speed in quasi-stock vehicles. The Subaru Impreza World Rally Championship racecar won the World Rally Championship for three consecutive years. The WRX is inspired by the racecar. Thats why it's got those muscular, blistered fenders. The WRX is only available as a four-door whereas the Impreza RS 2.5 was a two-door. Standard high-performance equipment in the Impreza WRX includes sport-tuned four-wheel independent suspension, four-wheel disc brakes with twin-piston front calipers and 16 x 6.5-inch alloy wheels with 205/55 R16 Bridgestone Potenza RE92 tires. Your dealer can installed accessory 17 x 7-inch alloy wheels and 215/45 R17 tires for a price. Inside the WRX youll find bolstered front sport seats (to help keep you centered behind the wheel), a Momo four-spoke leather-wrapped steering wheel and aluminum alloy pedals with rubber grips. To add a little luxury to your rallying the WRX has air conditioning, an 80-Watt six-speaker stereo, six-disc in-dash CD changer, keyless entry, power windows and door locks, and a fold-down rear center armrest. During the time I had the WRX I also had another press car. This was one of the few times Ive allowed two cars to be delivered at the same time. The other car had already been scheduled when the WRX became available. I was not going to miss the opportunity to drive the WRX. So one car sat out front and while one wracked up the miles. Any guesses as to which one? Much of my real road time was on the highway back and forth to Sacramento. Not really what the WRX was designed for. But it was fine. Sometimes sport seats arent real comfortable on the long haul. These were. I also made some time for some back road driving. Great fun. A couple of times I purposely dove into a corner that was wet or sandy, downshifting into second gear and nailing it for a quick exit. No problem, no wheel spin, just rapid acceleration towards the next corner. Column Name: "A true Performance Car by any measure"